On December 26, 2006, I published the first article to this blog. This month - a little over six years later - marked the 400th. Some have been excruciatingly long, a few have been short, as this one will be. I hope most have had some value in informing you about issues I feel are important to the future of our community. I'm gratified when I hear people talking about the impact of residential development when it is not matched by a similar amount of commercial development, even when it means getting yelled at for voting to sell a piece of property to a residential developer. This was a dynamic I didn't understand until six years ago. 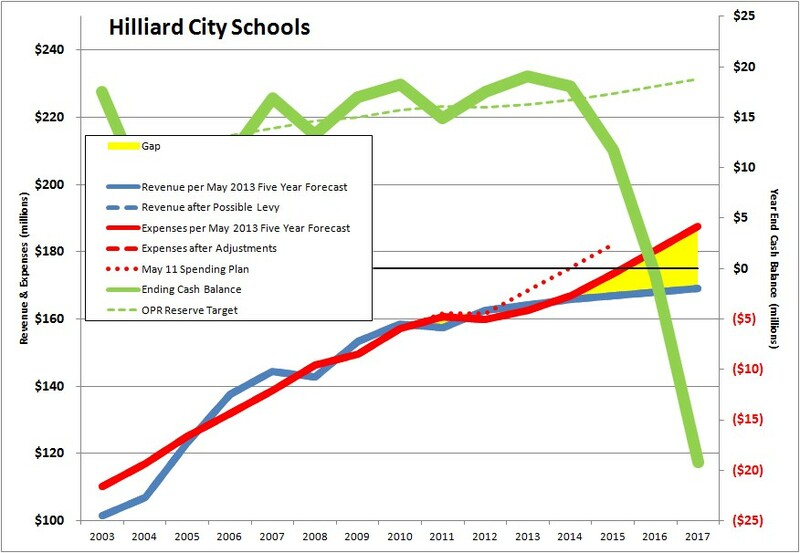 I have come to believe this is one of the two of three most important matters for our community leaders to address if we want the Hilliard community to remain economically healthy, and it's been a primary topic of this blog over the years. I hope to have helped people gain a better understanding of how our public schools are funded. The consequence of having a law that prevents our property taxes from automatically increasing when property values change - which I think is a good thing - is that the only way to increase funding is to pass more local levies. This is doubly true because our community is viewed to be affluent by our State leaders, meaning they are inclined to send any new money they find in the State budget to the urban and rural districts, who are also better represented (in terms of numbers of members) in the General Assembly. The current General Assembly may buck that trend by the way, but the language of the Budget Bill now under consideration in the Senate has both some "giveth" and some "taketh away," so let's not celebrate quite yet. And while we can whine about half-empty school buses or lights on in our football stadiums, I hope people understand that the cost of running our school district will always be driven by the number of people we employ and how much we spend on compensation and benefits. It's not just about the number of principals in the high schools, the number of administrators in the central office, or the richness of our high school course catalog. It's all that stuff and more, and it all needs to be discussed and evaluated. It will be done in a democratic fashion, which is to say messy and argumentative. By definition, the majority will be satisfied with the outcome, while others will be convinced that exactly the wrong decision was made, and they'll be vocal about it. ... but it has long been one of my favorites. Thanks for reading, and I hope you continue the journey with me. Here are the documents provided to the School Board in connection with our upcoming meeting, to be held at 7pm on Monday May 28, 2013 at the Central Office Annex. Last October, the forecast showed our cash balance at the end of FY2017 (June 30, 2017) to be negative $28 million. The new forecast shows this number to be negative $19 million. This is a good thing. But why the charge? Our revenue is derived primarily from two sources: 1) local property taxes collected from the homeowners and commercial property owners in the school district; and, 2) funding provided by the State of Ohio. The local property tax collection changes only when new properties are constructed, or when the voters of our district approve an additional tax levy. Because of a law passed in the 1970s - commonly known as HB920 - the property tax collected on an individual piece of property is not allowed to change just because that property is revalued by the County Auditor. I think this is a good thing by the way, although many - especially those in the education community - tend to disagree. The more variable part of our revenue is the funding from the State of Ohio. Both Governors Strickland and Kasich promised to toss out our the school funding system of their predecessors and replace it with something better. They each achieved half of their goal, dumping the old system but leaving us with what could generously be called incomplete ideas. That means that while the local property tax revenue can be projected with very good accuracy, all we can do is make guesses about what the state revenue will be. Treasurer Wilson consults with his peers in other districts and advisors from organizations like the Ohio Association of School Business Officials (OASBO) to seek the best information he can, but what we actually get still hinges on the political process. This new forecast projects total revenue to be about the same as with the October forecast, but with some adjustments as to the sources. 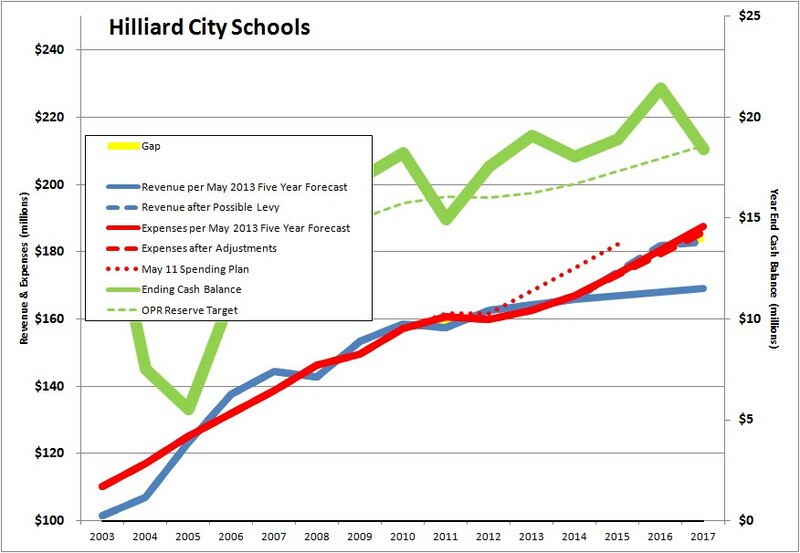 Mr. Wilson feels our local property tax collections will be a little less than the October forecast because new construction growth has been less than anticipated. However, this is somewhat offset by higher personal property tax collections on utility infrastructure, primary due to substantial investments made by American Electric Power. Another source of revenue which has dried up over the years is interest earned on the cash reserves we maintain. While there may be many benefits to our economy in keeping interest rates near zero, one consequence is that those who count on interest as income (including retirees like me!) are being affected. Not that long ago, our annual interest income was over $1 million. Now it's a tenth of that. For now, the positive seems to be that the State of Ohio is returning more of the state income taxes we've collectively paid, increasing slightly the funding to our schools. 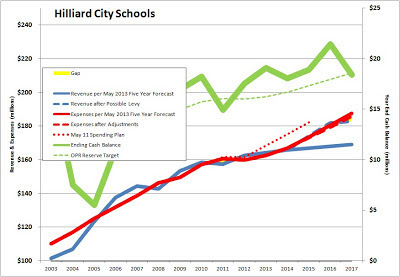 In this forecast, Mr. Wilson increased our projected annual state funding by more than $1 million each of the five years. Taken together, these component changes are expected to cause our revenue to increase over the next five years at a compound annual rate of 0.8% - essentially flat, as the chart above shows. On the spending side, our major expense is, and always will be, the compensation and benefits for our team of teachers, support staff, and administrators. This is 86% of our expense budget, and 92% of our incremental spending. Between FY03 and FY10, our spending for compensation and benefits increased at a compound annual growth rate (CAGR) of 5.6%, while enrollment increased at 1.9%, meaning our cost of comp and benefits per student rose 3.7% per year. This is reflected in the slope of the red line in the chart above. From FY11 through FY13, the rate of the spending growth for compensation and benefits was moderated by changes to the collective bargaining agreements with the unions representing the teachers and staff. This included base pay freezes, the elimination of one "step" (see this article for a detailed explanation of our compensation system), and early retirement incentives. As I have said before, I appreciate the contribution our teachers and staff made toward stabilizing our fiscal standing during a scary economic period for our country and our community - which is not yet over. Add it all up, and it means that we are projected to spend $34 million more than we take in over the next five years. That sounds scary - and it certainly should not be trivialized. But it is the way things work in the public school domain. Revenue tends to remain flat, partly because of HB920 and partly because the State of Ohio doesn't generally feel any political pressure to send more money each year to districts they deem to be affluent, which includes us. Meanwhile, our costs increase to a small degree because of additional programming and services, often mandated by the State of Ohio, but mostly because of the increased cost of compensation and benefits for our team. And it's becoming less a product of the former, and more a product of the latter. In FY03, the mix was 75% compensation and 25% benefits. By FY15, the proportion will change to 70% compensation and 30% benefits. In dollars, it means benefits costs are growing annually by nearly the same amount as compensation. This is a concern, and something we'll have to address with the help of the teachers and staff. So what does it cost to fund this forecast - which is to say, how many more mills of property taxes would we have to pay to maintain our policy of a cash balance of 10% of expenses? By my calculations, based on the assumption that 1 mill of property taxes raises $2.3 million of new revenue, then a levy of 6.4 mills would have to be passed by the voters in 2014 to fully fund this forecast. I think that's too much. Remember that our community shot down a 6.9 mill levy request in May 2011, and just barely passed - close enough to require a recount - a 5.9 mill levy in November of the same year. 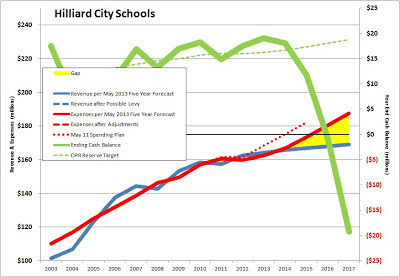 If the proposal the 2014 edition of the School Board decides to put before the voters is for another 5.9 mills, what has to change in the forecast? I think this is doable. It would require some difficult conversations, and some hard decisions. But I think it can be done. Therefore, I'll be voting to not accept the forecast as presented, and will ask Dr. Marschhausen, Mr. Wilson, and my fellow School Board members to begin the dialog to revise our plans. I'll also call you attention to the first reading of a batch of policy changes. I've not spent time with this document yet, and won't comment until I do. I encourage you to read the excellent synopsis of the proposed changes prepared by the Policy Review Committee, and let me or other Board members know if you have feedback. Here are the documents provided to the School Board in connection with our meeting, to be held at 7pm on Monday May 13, 2013 at Heritage Middle School. It's always rewarding to read the several pages of names of seniors who will be awarded diplomas in just two weeks. This is why public school districts exist, and this list represents the long, successful effort of thousands of students, parents, teachers, staff, and administrators, plus the whole of our community via your substantial financial support. Among the many personnel actions are the resignations of principals Brian Blum of Horizon Elementary, Jane Leach of Beacon Elementary, and Dave Stewart of Bradley High School. Brian and Dave have been offered positions in other school districts, positions that represent the next step in their careers. We have a great cadre of leaders in our school district, which is a tribute to our top executives, Dale McVey and Brian Wilson. But the management structure of a school district narrows pretty quickly from the twenty-two principals who lead our school buildings to the handful of executive positions at the Central Office. Couple that with the fact that we've had only two Superintendents over thirty years, and there just aren't that many opportunities for advancement from the principal level. So we have to expect that we'll occasionally lose some great leaders in whom we have invested much, and who have given us much, as they seek to further their careers. I think it's a outstanding achievement for an organization when it becomes a place from which others recruit their leaders, such as Superintendent Dr. Thomas Tucker of Worthington City Schools and Treasurer Melissa Lee of Delaware City Schools. Such is the case with Brian, who will become the principal at Daniel Wright Elementary in Dublin City Schools; Dave who will be the new Deputy Superintendent for South Western City Schools; and Steve Estepp, who is the new Superintendent for Mariemont City Schools. At the same time, we welcome to the Hilliard team new principals Betsy Long (Beacon), Hilary Sloat (Horizon), Jon Wray (Brown). Jane Leach is a lifelong education warrior who has decided to end her season in public school administration and move on to pursuits that give her more flexibility with her time. Education and community service is in her DNA: her father is Joe Davis, who was the highly respected Superintendent of Columbus City Schools from 1977 to 1982 - leading that huge district through the extremely difficult period when the federal lawsuit of Penick vs Columbus Board of Education was litigated. This is the lawsuit which culminated in the order by Judge Robert Duncan for Columbus Schools to implement busing, with the intention being to eliminate racial segregation. The consequence has been exactly the opposite, as it led to the "White Flight" that caused the suburban districts like Hilliard to explode, and led eventually to the Win-Win Agreement. Jane had a front row seat to all this, eventually becoming a principal in Columbus City Schools, a role she held for more than twenty years until we had the opportunity to bring her to Hilliard as principal of Beacon Elementary. I've had the privilege of getting to know Jane well while serving as one of many volunteers of a faith-based organization called the Columbus Tutoring Initiative, part of Mission Columbus. I thought I was facilitating a new connection when I introduced Jane to Tyler Flynn, the founder of Mission Columbus. It turns out that they have long known each other, as Tyler modeled the Columbus Tutoring Initiative after a program Jane had established when she was principal at Highland Elementary School in the Hilltop. Jane continues to be involved with the Hilltop Preschool. Jane was eager to let us start a similar program at Beacon, and this year we had nineteen wonderful volunteers who worked one-on-one with nineteen first graders during one lunch hour per week, under the professional guidance of first grade teacher Ellen Harpham - yet another jewel in our district - and Natalie Swider, a volunteer who did a fantastic job of coordinating the efforts of the rest of the volunteers. Being in Beacon every week has been a positive, meaningful experience for all of us - volunteers and kids alike - who participated in this program, and it was in no small part due to the way Jane leads her team of outstanding professionals. Thank you Jane for your many years of service to public education, and for your leadership in our district. And for any of you who might want to participate in this lunchtime reading program, we'll again be reading with kids at Beacon next year. Go here to learn more about the program, and if interested, send in an application. We are also in the early stages of developing the same program at Hilliard Crossing Elementary, hopefully with the sponsorship of a nearby church. These lunchtime reading programs are spreading across the region, and we believe we have a proven model which can be replicated in any elementary school. All it needs is a sponsoring organization and a set of volunteers to come forward - churches make for wonderful partners. How about yours? If your organization might like to sponsor a lunchtime reading program, please shoot an email to me. "Patrick Shivley, a Columbus developer who is founder and managing director of Help All Kids Play, said he presented his proposal to Hilliard board members during a closed executive session July 5, 2012." There was no 'closed executive session' on July 5, 2012. The Board did hold an executive session at the end of the regular Board meeting held on July 9, 2012 to discuss the sale of property, as recorded in the official minutes. I was present for this session. However, I have never met Mr. Shivley. The headline "Hilliard board received higher offer for 124 acres" fails to consider the time-value-of-money. Paying the Board $50,000/acre over 30 years is not the same thing as getting $50,000/acre - $6.2 million - in cash at closing. Assuming 30 annual payments of $206,667 ($6.2 million divided by 30) and an interest rate of 2.83% (this week's yield on the 30 year Treasury Bill) the Present Value is $4,141,240. In other words, on a Present Value basis, this offer is more like $33,400/acre, substantially less than the Rockford offer. For the Shively offer to have the equivalent Present Value as the Rockford offer - which netted to $38,800/acre after the 3% brokerage fee - the Shively offer would need to have been to pay $240,000 per year for 30 years, totaling $7.2 million or $58,089/acre. You are welcome to examine my calculations.